This report provides an analysis of the status of gender equality in national climate policy in light of the Paris Agreement. It also presents a framework for integrating gender equality into Nationally Determined Contribution (NDC) planning and implementation. This report analyses the degree to which the Intended Nationally Determined Contributions (INDCs) submitted as of April 2016 have recognized and/or integrated gender equality. 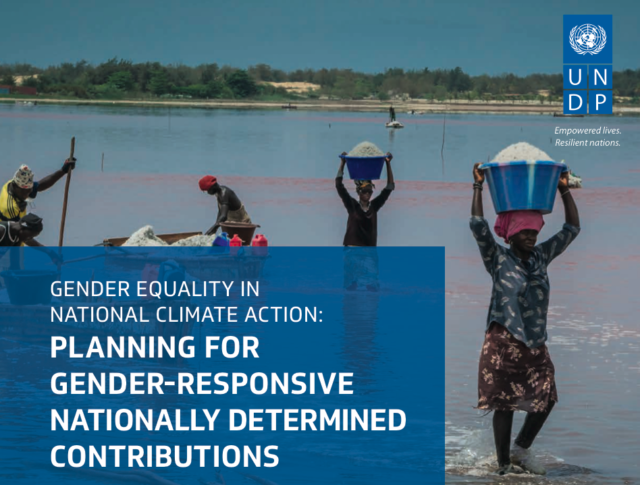 It includes supplemental research on gender equality references in selected documents submitted to UNFCCC, including National Communications (NCs) and Biennial Update Reports (BURs), Nationally Appropriate Mitigation Actions (NAMAs), National Adaptation Programmes of Action (NAPAs), and National Adaptation Plans (NAPs). The report also provides an overview of progress to date, including challenges, gaps, and opportunities in the integration of women’s empowerment and gender equality into national climate policy and action—particularly as countries begin implementation of their Nationally Determined Contributions (NDCs).